This EASY Rhubarb Raspberry Dessert Recipe makes a deliciously delicious stewed rhubarb with the addition of sweet fresh red raspberries! Scroll down to see the finished dessert! 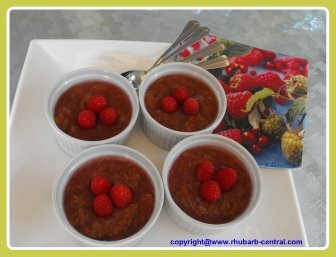 Rhubarb and raspberries are usually available in season at the same time, so use the opportunity to make this Rhubarb Raspberry Dessert fresh, or out of season, you can use frozen rhubarb and purchase fresh raspberries. You can make enough of this to use as a dessert for a large number of people, or for more than one day's desserts for less people. I use this recipe as a side dish for many meals that I prepare. Rhubarb is nutritious, and likewise raspberries are also nutritious ! Combine the rhubarb and the water on the stove over medium - high heat until rhubarb comes to a boil. Turn heat down to low and let simmer for about 1/2 hour, (or until rhubarb is tender), stirring occasionally. Remove from heat and stir in the sugar, and mix well. Add the flavoured gelatin and continue to stir well, ensuring that all the gelatin is well mixed in. Let mixture cool for about 20 minutes on the counter, stirring occasionally, and then refrigerate. Before serving spoon into individual bowls and garnish with fresh raspberries. Note - I store this Rhubarb - Raspberry Dessert in the refrigerator for up to one week.